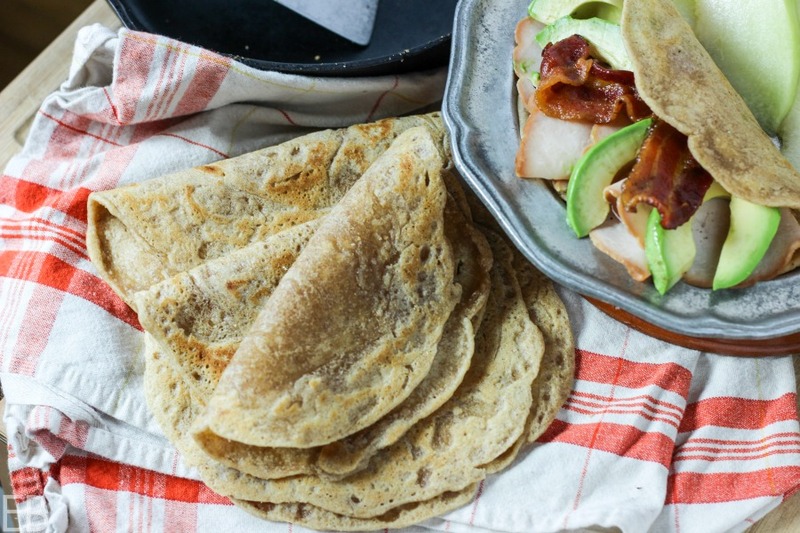 Tortillas are delicious and complete a meal: Tortillas make fun wraps, they’re perfect for breakfast, lunch or dinner and they make any meal special. Tortillas are bread that we shape and hold. They are visceral. But the one thing I don’t love about tortillas? Rolling them out. So this recipe doesn’t! 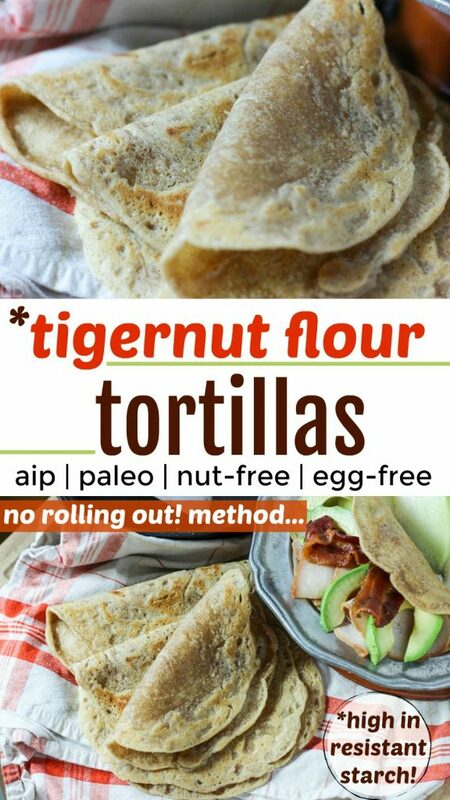 I’ll show you how to make Tiger Nut Flour Tortillas that are Paleo, AIP, egg-free, nut-free and DON’T need rolling! 6 tortillas and not too much work. Plus, these tortillas are rich in complex carbs and resistant starch, so super healthy for digestion, energy and blood sugar levels. You just need a few ingredients — so let’s get started…! Tiger nuts are little tubers (not nuts at all). A great source of fiber, tiger nuts are also high in minerals like iron, and vitamins C and E.
Tiger nut flour (find it here) is a boon to all grain-free, Paleo folks! Even if someone chooses to eat grains, this flour is not to be missed. What does it taste like? Graham cracker crumbs, actually! And a bit of wheat bran texture too, but more nutty, moist and tender. You can find me using it in Paleo muffins here and in Paleo and AIP porridge here. Tiger nut flour is THE best source of resistant starch. This means you might love the improvement it makes to your bowels! Tiger nuts are wonderful for colon health, and you’ll likely notice. Resistant starch (called RS for short) is a kind of prebiotic that creates a healthier gut ecosystem, especially in your colon (source)! It’s one of life’s unexpected gifts that you can eat the Paleo, whole food version of graham cracker crumbs and improve your GI tract! The second reason most people start using tiger nut flour is because it adds to one’s baking repertoire — one more tool (ingredient) in the kitchen to make great Paleo baked goods. I love how it behaves in egg-free, AIP baking! As I have alluded to, tiger nut flour is DELICIOUS too. One of my favorite ways to use it is as a topping. I love the flavor, texture and sweetness it offers. Every time I use it or make something like tortillas with it (where you can really taste it) I am struck by its rich sweetness. What a treasure-food! So yes: You can sprinkle tiger nut flour on top of porridge, puddings, smoothie bowls, yogurt and more, in addition to making tortillas, muffins and porridge with it! Enjoy a new favorite Paleo topping!!! 🙂 Pretty exciting. Lastly, tiger nut flour is super allergy-friendly. It gives you that nutty quality but is high in monounsaturated fats instead of omega-6s (contrasted with almonds) and is easier to digest than nuts for many people. Find tiger nut flour here. Tiger nut flour lends itself really well to egg-free and vegan baking. It produces a light, tender, moist crumb. 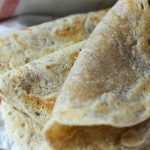 In this tortilla recipe, I’ve paired it with tapioca flour, which is quite elastic in texture, and well suited for tortillas. Tapioca flour also provides complex carbohydrates and is a good egg-free baking ingredient, but it’s not super nutrient-dense. (Read more about tapioca’s nutrition and history here.) So I like using tiger nut flour to anchor the recipe, both flavor wise and nutritionally. 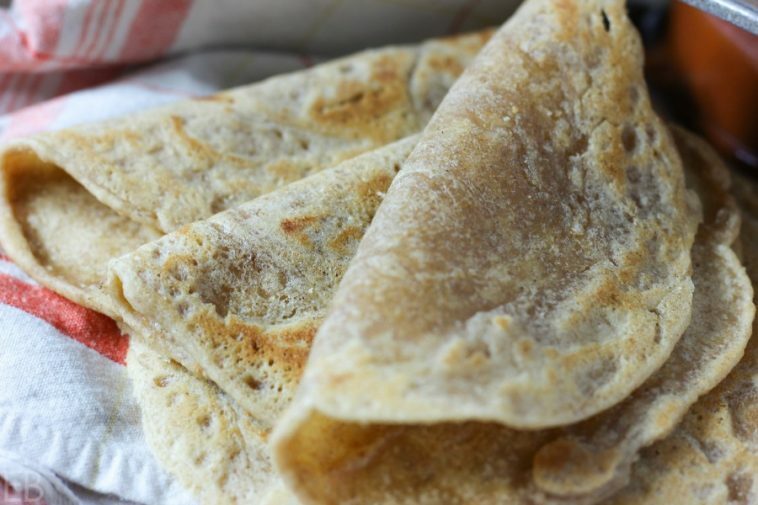 These tortillas give you long-yielding energy, no insulin spike and even a bit of protein in the absence of eggs. Now, fill them with protein and more fat…! For casual lunch-style food, fill them with deli meat, bacon and avocado. Go Mexican, and fill them with shredded or ground meat, fresh cilantro and salsa. Or do fajitas with steak, sweet potatoes and onions. Serve them with any stew or soup. Fill them with all your favorite salad ingredients: lettuces, avocado, thick dressings or dips, shredded veggies and fresh herbs. Any combination of leftover meat and veggies. If you eat butter, I also really like these tortillas with Kerrygold butter and sea salt sprinkled on top. In medium size saucepan, over medium-low heat, gently melt fat. Remove saucepan from heat. Add sea salt and both flours: tapioca and tiger nut. Stir with wooden spoon until well mixed. Heat large skillet, preferably cast iron, over high heat. When hot, melt a small amount of fat in pan and spread it around thinly. Place 2 ounces tortilla batter in middle of hot pan (a scant 1/4 cup). [See easy batter scoop I use in Recipe Notes. Use it slightly heaping.] Use offset spatula to spread batter into a round circle, (like a French crèpe). Don't worry about getting it perfect. It gets easier to spread them the more you do. The tortillas will be about 6" in diameter. Cook on the first side about 90 seconds-2 minutes, until sides and middle allow you to easily scoop under it and flip with metal offset spatula. Use spatula to flip. Cook an additional 60 seconds on second side. Repeat with additional tortillas, reducing stove heat to medium. (Do not put fat in pan between each tortilla, only before the first one.) Cover tortillas with dish towel or upside down plate until ready to eat them, to keep them soft, moist and pliable. I use 2 different offset spatulas to shape and flip the tortillas: one spreads the batter (find it here), and the second flips (find it here). Find the easy batter scoop here. Oh these look so yummy to me right now! I have got to buy some tiger nut flour and make some. It sounds like it could be a really nice option for me right now too while I have so many food limitations. Emily, tapioca is like potato for the food intolerance category, if that’s helpful. I know you’d love tiger nut flour though!! xo! I need to experiment with tigernut flour more. Love this delicious recipe! So excited to try these!!! 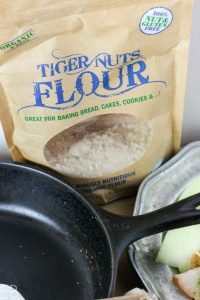 I love tigernut flour and have not had it on hand in awhile, will order some so I can try these! Ok this recipe is gonna hop me on the tigernut train I think! I haven’t made anything with it before but these look fantastic! Thanks, Renée! The best surprise about tiger nut flour is just how sweet and yummy it is! One of those amazing food treats because it’s so good for us, but it’s a fun food to cook with too, and delicious. I hope you love it and get to make the tortillas! What a healthy and fantastic idea Megan! Pinned for later. Probably, but I haven’t tried it, so let us know if you do. I have refrigerated them, and then they need to be warmed to have the right texture again, which works well. I’ve never tried tigernut flour, but these look so good! Can’t wait to try them out, I’ve really been craving tortillas lately! Great Kari! I hope you love them as much as we do. They’re a new staple for our family. I love how quick they are to make and with such a great texture! 🙂 Enjoy and thanks for commenting. can’t consume coconut oil, what type of oil can I sub for it in the tortilla recipe? Hi Joanna, You can try avocado oil or olive oil! 🙂 I personally use butter, melted and cooled (if you can tolerate dairy). Fast reply==Thankyou, can’t consume avocados & don’t care for oilve oil==what abt sesame oil? Yes, should work, but I haven’t tried it to know for sure. Tigernut flour is one of my favorite flour! I’ve never tried tigernut flour before. What awesome tortillas it makes! Ah this looks fantastic! Thanks for sharing, never considered this as a flour substitute. Oh good. You’re welcome. I hope you enjoy tiger nut flour, Darryl! Will casaaca flour work as a sub for the tapioca? Hi Theresa, no, unfortunately. 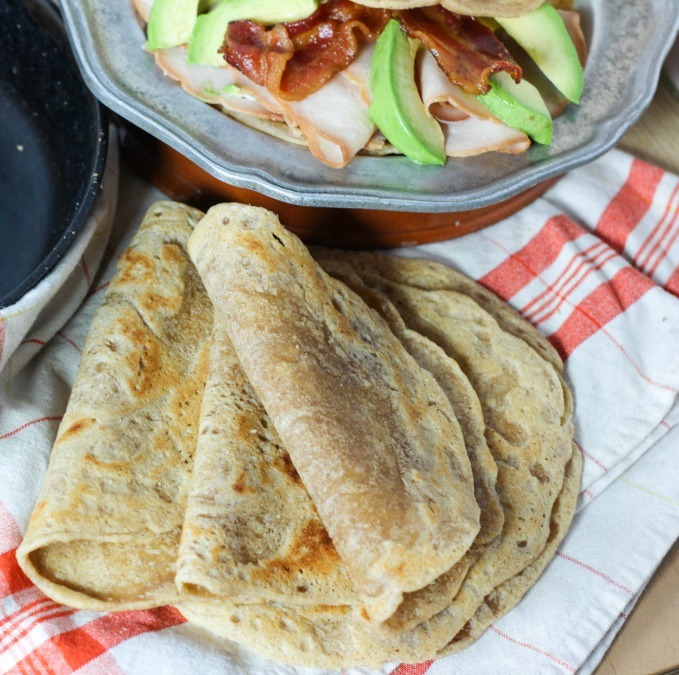 Cassava flour tortillas are delicious!! as I’m sure you know, but the two ingredients behave very differently in recipes. Do you have a link for where to buy tapioca flour? I have never used it before. Megan, Another question. The Tenrai set of spatulas just became unavailable on Amazon. Which size out of that set is the one you use? That link now takes me to the 10 inch Tenrai. Is that the one? Thank you! What size do you use from the other set? It is available to purchase, I am just curious. Hi…are these ok on the candida diet? Hi Sara, no, I’m sorry: too many carbs. I need nutritional information on these tortillas, especially carbs per tortilla, keto friendly??? Hi Felicia, these aren’t keto; I’m sorry. 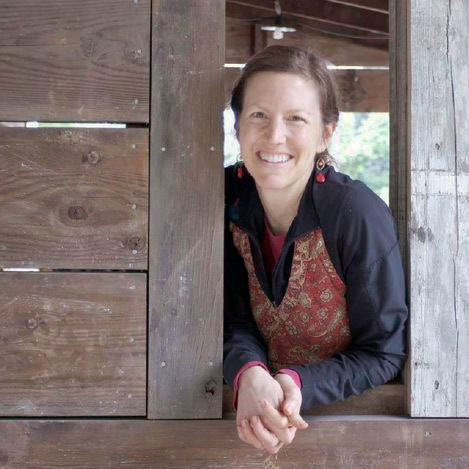 My friend Maya has a great one, though: https://www.wholesomeyum.com/recipes/coconut-tortillas/ Blessings! Hi Lynn, Just covered on a plate. You can put a small square of parchment or waxed paper between them if they stick to each other. These taste delicious! I love not having to roll anything out. My first one was way too thick though. The batter didn’t move and it was very difficult to spread on the hot cast iron pan. I eventually added another 1/3 cup of water to get the batter to spread out thinly. Thank you! Thanks for the extra water tip. I did just a little bit and it made it so much easier! I had to add double to triple the amount of water. As published it because a firm dough instead of something I could spread. I would use a tortilla press for the less water version instead of an crepe style. WOW! What brand of tiger nut flour did you use? These taste good, but I couldn’t get them to spread so they were thick. I followed the directions so am perplexed. Is the batter supposed to be thick? Hi Pamela, which brands of tapioca and tiger nuts flour did you use? That might be the issue. Otherwise, the batter should be thick but very spreadable with the offset spatula. Glad you liked the flavor. 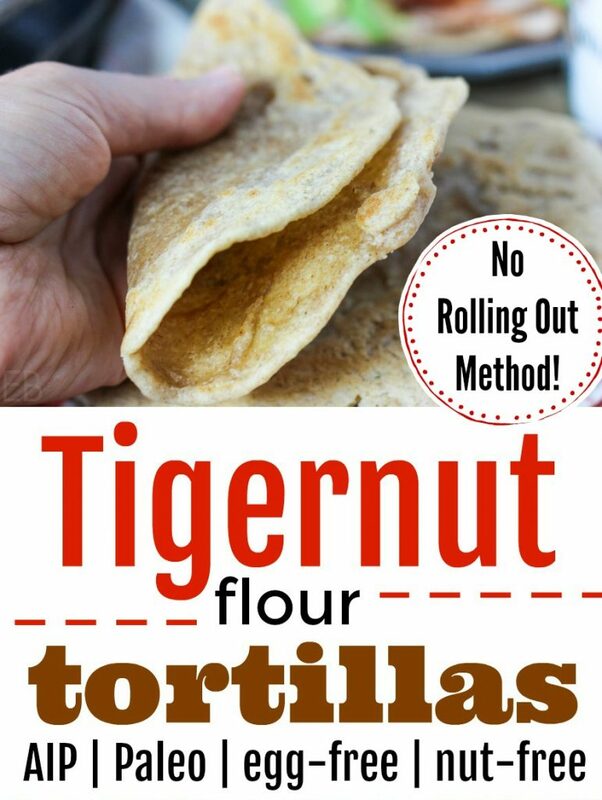 I’ve never tried tigernut flour, but clearly, I must! It’s great to have a variety of flours in our gluten-free tool chests. Pinning for future reference! These look great Megan! I just made my first batch of tiger nut milk and was searching for a recipe to use up the pulp. The pulp has very little of the original flavour but would still be perfect for a recipe like yours. Very keen to give it a try. How about freezing these? How are they best stored? Are the tortillas “prebiotic” if they aren’t heated a second time (as true for potatoes?). I’m just learning about probiotics and excited to gain more info. Thanks, hoping to try this weekend, I have the ingredients!!! I loved them! I did add more water until it was a bit watery then poured it in the pan while tilting the pan, like I was making a crepe. That worked great!! They are a bit sweet so I made a strawberry jam by blending 6 strawberries with 2 medjool dates..so yummy together! Thank you! I hope to try this recipe using arrowroot instead of tapioca, keeping fingers crossed it will work! Thoughts? I’d love to hear how it goes. My thought is that arrowroot when used in baking is crumbly not stretchy, whereas cassava and tapioca are almost gluten-like; they are stretchy. So I don’t think it will work. I do think the recipe will work with cassava or it may with arrowroot if you add something stretchy that you can tolerate, like xanthan (which many grain-free folks and maybe yourself avoid), psyllium husk powder etc. Good luck!